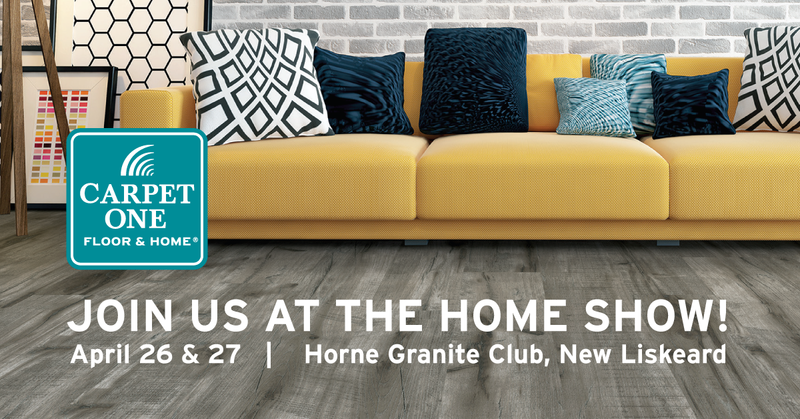 Carpet One New Liskeard is excited to announce we will be set up at the 2019 Lifestyles Home Show! We have some exciting displays for both indoors and outdoors to showcase some of the best products for your home this year. Stop by our booth and tour our displays and cash in on some exciting deals and offers. We will have door prizes and giveaways exclusively for those who stop in for a visit! Outdoor Display will feature our outdoor products such as Fire Pits and Landscaping Kits by Barkman! Indoor Display will feature a variety of flooring and area rugs including our Luxury Vinyl Planks and Tile which are this years hottest item! Welcome to Carpet One New Liskeard Floor & Home! We offer everything you need for all your indoor and outdoor home, rental property or business renovation projects and flooring needs. Our experienced staff have proudly served the community of New Liskeard for 44 years. With our large selection of flooring and home renovation products, you'll be able to find exactly what you need to suit your style and budget. We carry quality brands such as Bigelow, Lee’s Studio, Tigressá, Innovia, Earthscapes and many more the options are endless. Carpet One New Liskeard offers services that can help you take your ideas, design and plan and turn them into a reality. Our experts are more than happy to help with installation and will make the renovation process less stressful for our customers. Why Choose Carpet One New Liskeard? Carpet One Floor & Home offers a credit card issued by Synchrony Bank for special financing. This credit card can be used multiple times for different purchases at Carpet One. We have a huge selection of products to suit all styles and budgets. The Beautiful Guarantee® ensures that you are satisfied with your new flooring if not we'll replace it for free! Shop Our Unbeatable Deals Now and Buy The Floor You Love Today!